The plan today was to meet with my producer and then go see 'The King's Speech' with Anna in Camden. But my producer had to reschedule because of a family thing so I decided I'd go see 'Blue Valentine' before meeting Anna. And then Irena facebooked me to tell me she was back in the country and she mentioned something about getting a coffee but instead she came to see 'Blue Valentine.' Actually we were early so we went for lunch in Chinatown, which was great because she offered to pay -- which I accepted after momentarily considering hesitating or offering to pay myself. The movie was great, but I was a bit annoyed because the concept, of showing the beginning and ending of a relationship play out over a movie was something I'd been wanting to do for years. The difference between my script and the one for 'Blue Valentine' is that they actually wrote their one. It's like that Sorkin line from The Social Network', "If they invented Facebook they'd have invented Facebook"
After the movie I'd had enough of hanging out with a talented and pretty actress so I went and hung out with Anna, a talented and pretty actress, and realised I could give up making the films and just hang out with actresses. Anna offered to pay for the movie which I accepted after momentarily considering hesitating or offering to pay myself. 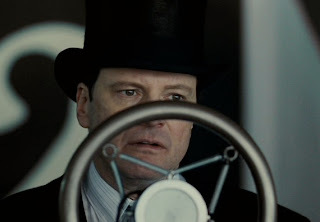 'The King's Speech' was like all English films funded by America; lengthy, full of strange accents, and simple. But Colin Firth did his thing and did it amazingly and is worthy of the Oscar he'll almost certainly get nominated for. And if anyone says "no way he's getting an Oscar, it's going to ACTORS NAME," you're probably right and it probably isn't important. The film ended and me and Anna hated the old women near us who'd been talking the whole time. We often thought of telling them to shut their stupid mouths but were worried; due to the nature of the film; that they may actually be royalty. That sounds crazy, but Anna is American and Americans think most people in England know the Queen. And then I jumped on the tube and began writing this blog as the guy opposite me picked his nose and the guy to my right had a weird smile on his face which is maybe because he can hear Ennio Morricone's theme from 'Malena' coming out of my headphones, but probably not. And then I stopped typing. Have to say I'd be thrilled if he got an Oscar even if I haven't seen the movie in question. I recently watched A Single Man and was amazed! Btw, can you recommend a really nice (not over the top priced) Lebanes restaurant in London? There's a lot of them but many are far from great. One of my favorite relationship movies is Closer. Although you don't really get to see how the relationships evolve, I enjoy that every scene is basically about a beginning or an end of a one of them. I love Turkish tea. We have a Mediterranean market and cafe that's not too far from my house, and they're always giving me free tea, and sometimes free desserts. Maybe Turkish people are just extra-super generous? "And then I stopped typing"